Making homemade soap is a great way to accent your bathroom or kitchen - and they're easy to make! 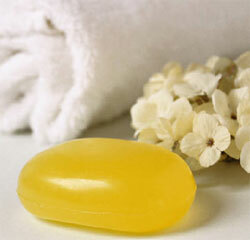 Decorative soaps are easy to make, using bars of glycerine or other pure, mild, unscented soaps. There are several ways to scent your soap at home. These include using essential oils or adding ground or finely chopped fresh or dried herbs, spices or flowers. I personally like to use lavender flowers but you can use mint leaves, chamomile, lemon balm, marjoram, rose, thyme and there are many more. 1/4 cup herb or flower infusion (recipe below) . Several drops of essential oil (available at craft shops) . 2 tbs. Fresh herbs or flowers, chopped or 1 tbs dried herbs or flowers . 2 cups grated glycerine soap or other pure, mild, unscented soap . To make homemade soap, combine your infusion, oil, herbs or flowers or whatever is desired, in the top of a double boiler. Heat until the mixture is simmering. Add soap and stir until well mixed. Pour into molds. When they are cool enough remove and age for several weeks. Coarsely chop enough of your fresh herbs and flowers to fill a pint or quart jar half full. Add enough grain spirits or vodka to cover the flowers. Put the lid on tight and shake daily. After a few weeks, check the scent by dipping a small strip of blotter paper in and letting it day. When the desired fragrance is attained, strain the alcohol, then add 2 tsp glycerine to each cup of alcohol and several drops of musk oil or tincture of benzoin. Bottle and label and please note that it is not for internal consumption. Making homemade soap is a very nice gift. They are also good sellers at craft shows. If you have any making homemade soap information and want to share it please contact me and I will add your idea.